Unbox Therapy uploaded an uncut video of iPhone 6 Plus bend test after avid Apple fans accused Lewis Hilsenteger as a fraud. To put the speculations at rest, he did the test again, and this time, right at the front of witnesses. 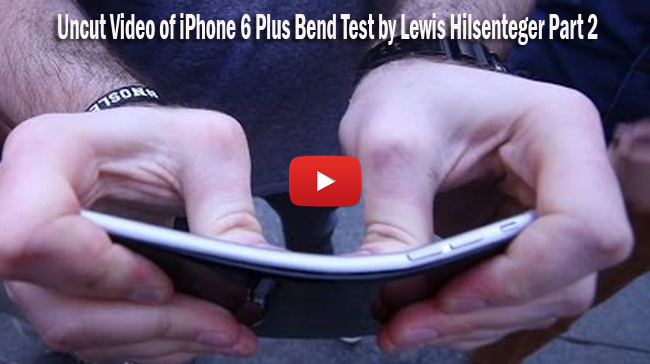 He specially made the video to prove the authenticity of the test some people questioned and speculated that he had edited his first iPhone 6 Plus bend test video uploaded on September 23, and now has more than 42.5 million views on YouTube. In his new video, Hilsenteger was in downtown Toronto and used a brand new iPhone 6 Plus that all the eyewitnesses could attest. He used his hands to forcefully bend the smartphone. Much to the disappointment of speculators, the phone did bend, and this time turned out to be much worse. The screen had visibly got loose from the phone itself and completely opened up. He also voiced out that he is concerned that more people could actually experience the same with their iPhone 6 Plus. He said that he is just a regular guy and used too much excessive force to purposely bend the handset. The uncut video was uploaded on September 26, and had already been viewed for more than 1 million times. He then took out another handset, Moto X to compare its durability. He wanted to prove that not all phone would bend. The second phone did not budge and remained it its original form despite the pressure he exerted. He also expressed his concern that phones are supposedly expected to be used for years and not just for a day. It is possible to build durable phones that people won’t be afraid to accidentally bend. Hilsenteger wrote in the description that iPhone 6 Plus is more bendable than the other things that he had tried to bend. He then challenged those who still did not believe him to do the test themselves.